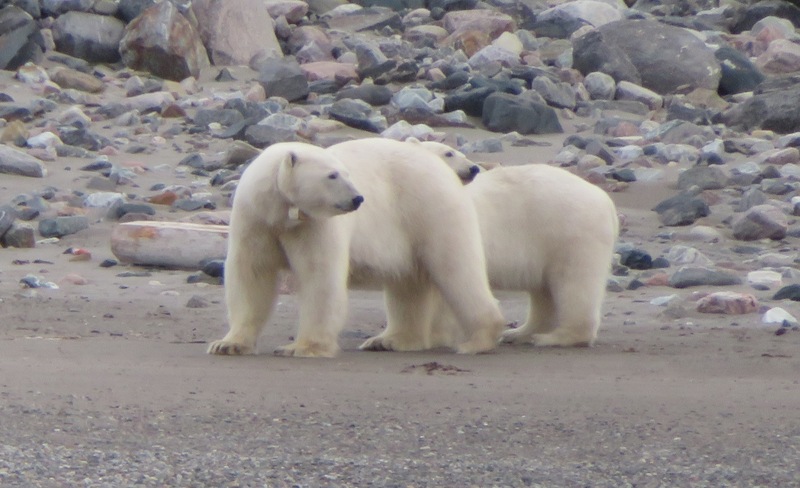 To see polar bears in the wild…that is a worthy goal. We were out in the zodiac, nosing along the shore, squinting and gazing and scanning and hoping. I told Mette it was perfectly fine if I did not see a bear…it’s difficult for me to focus binoculars so I maintained my state of denial just in case. Then. There. They. Were. Right there in good solid eyesight range, no need for binoculars. OMG. Whatever anyone tells you there are few sights so grand as a big mama polar bear loping along with her (probably) yearling cubs. So without further ado…here they are. out the poet in the flesh walkers. to Danes, Ice Bear; for many, Sea Bear. and the wits of eleven. Siberia’s Ket people esteem all bears. To them I am Grandfather. God’s Dog or Old Man in the Fur Coat. Remember all my names—or none. ← GLACIER. ICE. FOREVER MOVING. What magnificent creatures…beautiful…and how could anyone harm them? But, we are harming them every day by producing all that global warming that is going to ruin their home, or most of it. I hope most of them can adapt in some way. Why are we so stupid? and they are so smart.